Associate Objects Conservator Lauren Fair and WUDPAC student Leila Sabouni share their observations with the owner during a conservation clinic. Learn more about the condition, care, and recommended treatment for your antique! 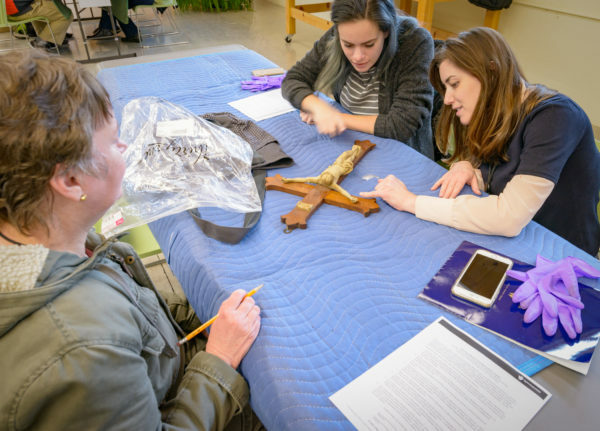 As part of its mission of public service, at no charge, the Winterthur/University of Delaware Program in Art Conservation(WUDPAC) consults on condition, care, and possible treatment of objects. Faculty, students, and Winterthur staff share with collectors, curators, owners, caretakers, and scholars their knowledge about caring for works of art and archival material. Owners or caretakers may make a 30-minute appointment to bring paintings, textiles, works of art on paper, books and archival documents, photographic materials, furniture, and decorative, archaeological, and ethnographic objects. By appointment only (call 302.888.4866). Free admission. Note: Limit no more than three objects per appointment. Monetary appraisals will not be given. Held one Thursday per month (1:00 pm–4:00 pm) at Winterthur’s Brown Horticulture Center. To learn more about Conservation during your visit to the museum, take a reserved Conservation Tour. Also, view the Conservation section of this wesite.